More and more Portugal is popping up on lists of the top places to visit. Economic trouble in Europe over the past few years has translated into great deals for travelers, with the cities like Lisbon’s value extending far beyond the Euro. I couldn’t agree more. I found the city to be very affordable, clean and especially pleasing to the eye, with its black and white cobbled streets, colorful azulejo tiled buildings and sweeping waterfront views. For a good first orientation you can hop on Lisbon’s historic tram #28E, which weaves its way across the hilly city. I generally prefer to explore a city on foot to truly experience the charm of its distinctive neighborhoods. 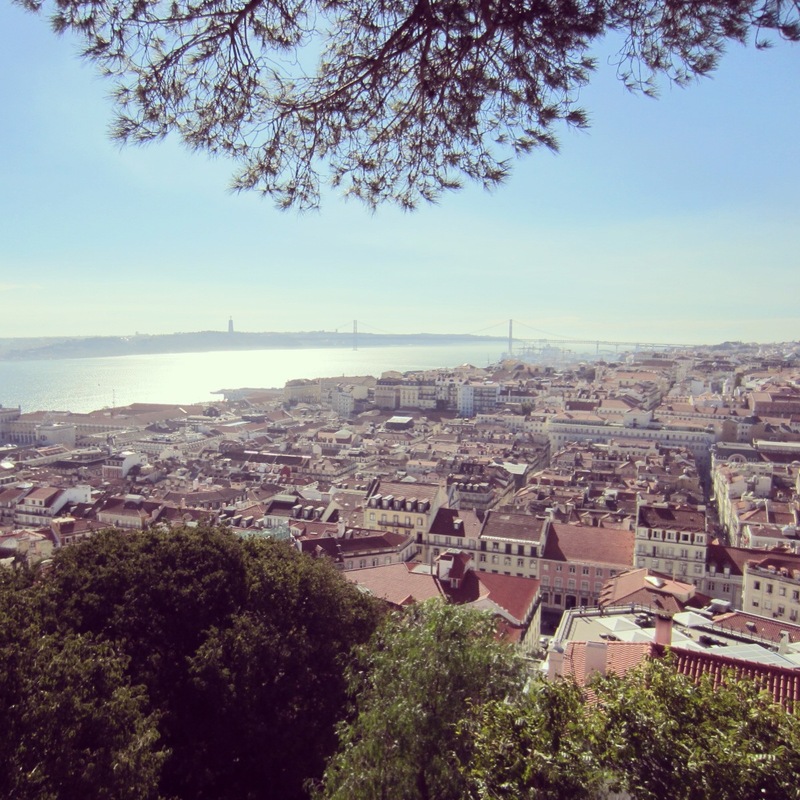 While each area in Lisbon deserves its own time, this route takes you through the historic core for a half-day of sightseeing, or in my case, was a good way to hit the ground running after a long day of flying. Our first stop was the São Jorge Castle in Lisbon’s Alfama neighborhood. Not necessary anticipating the challenge, we hiked our way up the hilly streets to reach the base of the 11th century fortification. Once there, our trek was rewarded with a pretty stunning view overlooking the city. To go even higher climb the towers then walk along the olive tree-dotted ramparts, and keep your eyes open for an encounter with a peacock or two running around the castle’s lower gardens. There’s also a little café to stop for a drink or light snack before you make your way down. Continuing through the medieval streets of the Alfama, we also visited the Sé Cathedral (the oldest building in Lisbon, having survived the 1755 earthquake), and stopped in some adorable shops selling decorative tile, cork and other Lisbon-esque items. After weaving through the Alfama, we spilled out onto Lisbon’s main riverside square, Praça do Comércio. As the former site of the royal palace the square still boasts an air of grandeur – with a triumphant arch that acts as a gateway to the city and regal yellow and white colonnaded buildings, matched by a seemingly endless blue sky and water that laps up to its edge. 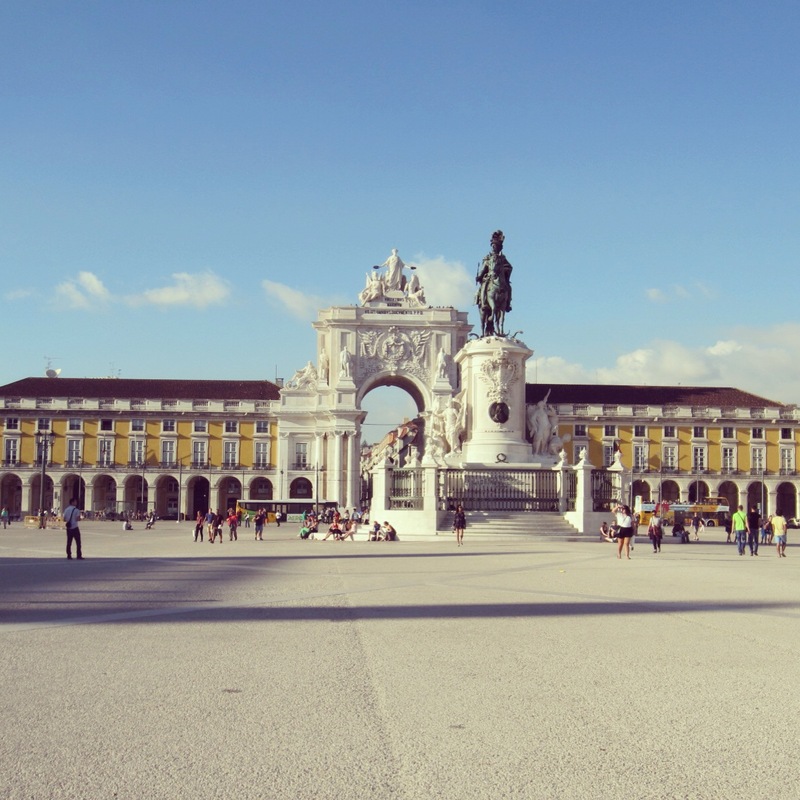 Today, Praça do Comércio is flanked by cafes and restaurants with outdoor tables that take advantage of the view, making it a good place to recharge. Plus it’s also the location of a tourist information office and the Portuguese Wine Tasting Center. On weekends you may also encounter an outdoor market with antiques, jewelry and other handmade items. After you pass through the archway you’ll notice the grid-like street plan that makes up the heart of Lisbon’s downtown, a contrast to the maze of streets in the Alfama. The pedestrianized streets in the Baixa swell with charm, from street performers to outdoor cafes, restaurants and beautiful display windows. And if you’re up for a little shopping, don’t miss the huge Armazéns do Chiado mall that connects the lower and upper town. 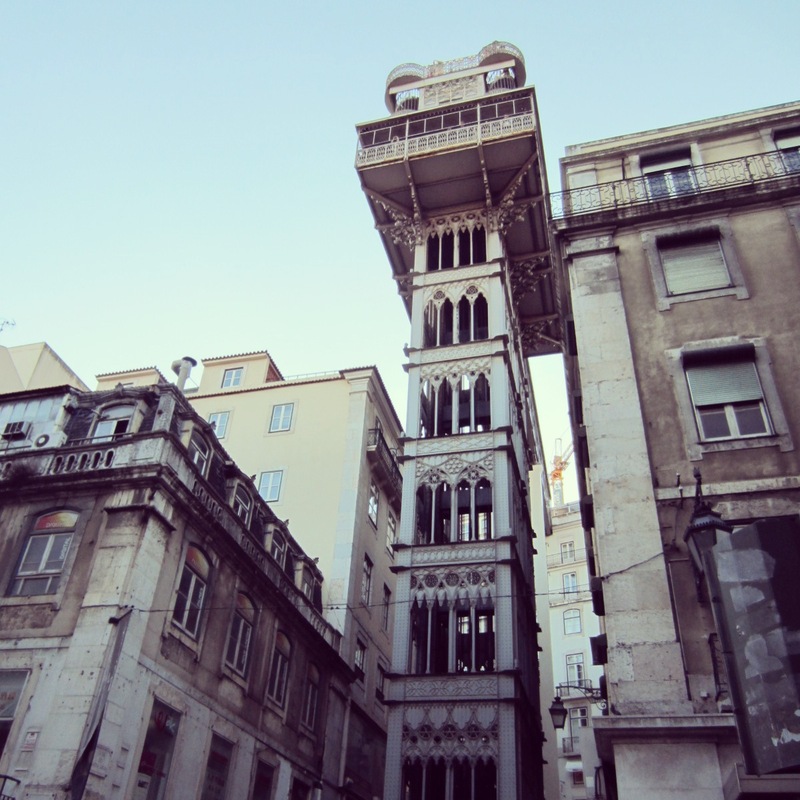 Another way to reach upper part of Lisbon (where you’ll find the Barrio Alto and Chiado neighborhoods) is the famed Santa Justa Elevator. This 147-foot tall structure dates back to 1902 and is made of iron, which makes sense since its architect was an apprentice of Gustav Eiffel. Take the lift to the top for yet another great view of Lisbon. 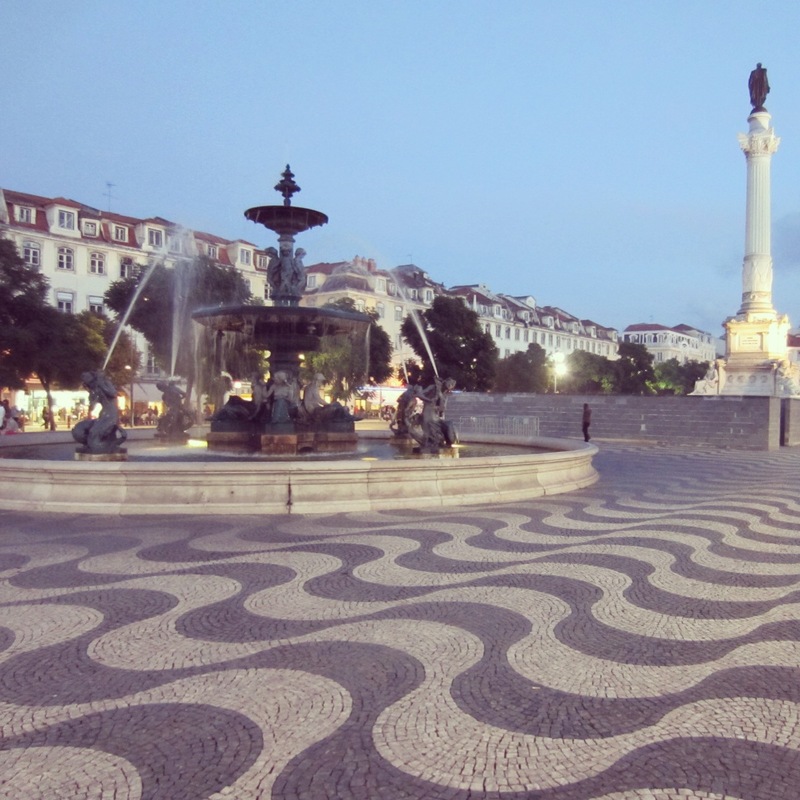 Cap off the afternoon with a beverage in one of Lisbon’s prettiest squares, Praça do Rossio. First you’ll pass through the busy Praça da Figueira, which serves as a transportation hub for many bus and tram routes, then continue on towards the black and white waves of cobblestone, fountains and the beautiful (yet discrete) train station that anchor Praça do Rossio. Grab a bica (a shot of espresso) at a café on the square or if you’re up for adventure, try Lisbon’s strong trademark cherry liquor at A Ginjinha at the northeast end of the square. Alternatively, you can continue up Avenida da Liberdade and find a little green kiosk café where you can grab a chair and take in Lisbon’s lovely ambiance. Have more time? Consider spending a day in Lisbon’s Belém neighborhood or taking a daytrip to nearby Sintra. Definitely, it’s such a beautiful city!